Please find attached agenda for the General Meeting to be held at the Roma Administration Centre on October 9, 2013 at 9.00am. 3. Endorse the draft communication addressing vehicles parking in the designated ‘No Parking’ and ‘Taxi Only’ parking areas at the Roma Airport. Recommendations are following discussions by committee members at the Airport Advisory Committee meeting, held on 4 September 2013. A number of passengers waiting for charter flights at the Aero Club building have been placing their bags on the roads and urinating on the building and surrounding area. To address this issue the Committee recommends that a path be constructed from the landside area of gate 4 at the Aero Club and run south along the fence to the current Administration Office. It is also recommended that additional signage be placed directing passengers to on-site amenities in the Administration Office area. A plan of the proposed location for construction of the path is attached. A number of vehicles have been observed parking in the designated ‘No Parking’ and ‘Taxi Only’ parking areas. The committee recommends that written correspondence be sent to bus operators and other identified users outlining parking designation requirements. If approval of the committee’s recommended approach is granted by Council, approval of the attaching draft correspondence is also requested. The addition of 34 car parking spaces would provide an expanded area for ‘non paid’ parking to occur. The current area designated for GA user parking is difficult to control, with vehicles parking in this area frequently requested to move to the ‘paid parking’ facility. In expanding the parking area for GA users there is potential for a reduction of revenue generated in the ‘paid parking’ area. Expansion of the GA car park is not included as part of the Roma Airport Expansion Master Plan. The Roma Airport Expansion Master Plan has allocated the location where the proposed path would be constructed as a future potential site for an additional hangar. Additional Parking - Costs in expanding the car parking area would be minimal and require the movement of a fence only. The parking designation is not sealed. In proceeding with the expansion however, there is potential for reduced revenue generation in the ‘paid parking’ facility on location. 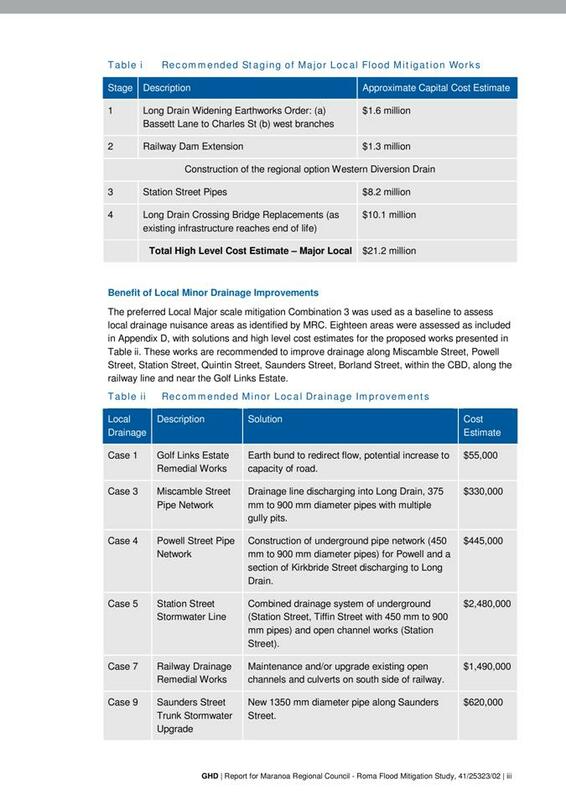 Pathway Construction – Estimates would need to be obtained to determine an estimate of cost. I am writing to you in relation to the parking of vehicles in ‘No Parking’ and Taxi areas located at the Roma Airport. Council recongise that there is currently a shortage of bus parking available at the Roma Airport. As a short term solution two (2) taxi bays and an additional area will be designated as a bus loading zone. These two (2) zones will be limited to the boarding and disembarking of passengers only. Due to the limited activities permitted in these areas, buses should not be left unattended or remain in these zones for any longer than is necessary. All vehicles are not permitted to stop in the remaining Taxi zone, it must remain clear at all times for use by taxis only. Penalties do apply to all unauthorised vehicles stopping in a taxi zone. Council has approved car park expansions that will provide a long term solution to the current shortage of bus parking and loading. Construction is due to commence in the coming months. Should you require further information please call Ben Jones, Manager – Airports (Roma, June & Surat) on 1300 007 662 or alternatively email enquiries can be directed to the Maranoa Regional Council’s enquiries email address council@maranoa.qld.gov.au, and attention to Ben Jones Manager – Airports (Roma, Injune & Surat). Apologies: Cameron O’Neil, Cr. David Schefe Michael Parker – Director – Infrastructure Services, Peter Flynn – Maranoa Travel Centre, Barry McCabe – Roma Aero Club, Christopher Kerr – Care Flight Group QLD, Vickie Beitz, Shane Brumby – MI Helicopters, Robert Lethbridge Jon Hamer – Qantas, Ian Rollinson, Scott Rodgers – Air BP, Meryl Brumpton – Flying Surgical & Flying Obstetric Service, Adrian Harding – Europcar, Anthony McDonald – Hertz Roma. Amend unconfirmed minutes from 7th August 2013 to show information missing as noted by Lyn Kajewski. Cr. Denton welcomed all present and declared the meeting open at 6.00pm. That the apologies be received for this meeting. Lyn Kajewski noted 2 corrections to be made from the minutes arising from the meeting held 7th August 2013. 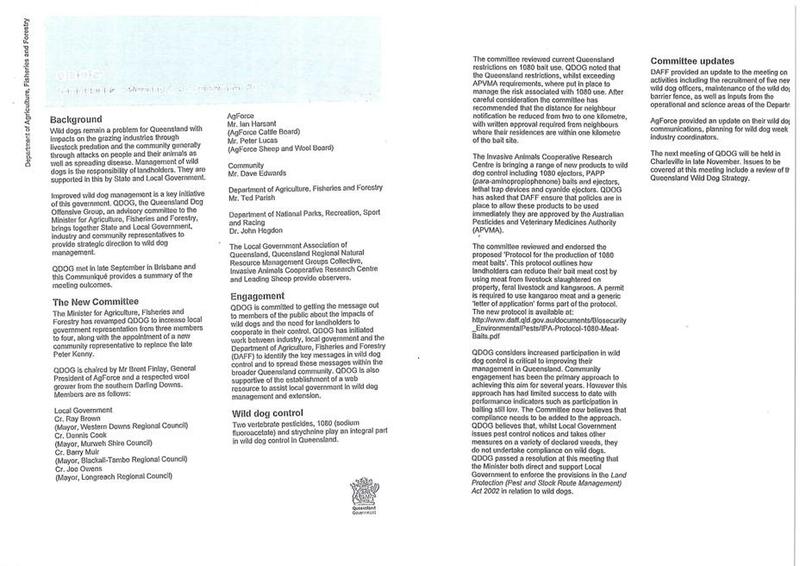 Item 4 General Aviation parking, omitted contacting Royal Flying Doctors Service in the consultation of additional parking. Item 9 General Business, omitted the time frame for Gary Schefe to seek expressions of interest from local business for retail outlets at the Airport Terminal. That the Airport Advisory Committee Meeting minutes of 7th August 2013 be confirmed, after the above mentioned changes are made to the minutes. Lyn Kajewski referred to the request for feedback from unsuccessful tender applicants for the kiosk at the terminal. Lyn advised that it is a council requirement to provide feedback to all tender applicants, regardless of being successful or unsuccessful. Ben acknowledged that there was an issue with the notification of tender applicants for the kiosk, in that the applicants were not notified in a timely manner. Ben noted that all applicants have been advised of the outcome of their tender application. Ben updated the committee on the progress of the consultation with GA business/users for additional parking required. After consultation with all businesses/users located in Hangar Drive, a total of 34 additional car park spaces. Ben advised that he will take this information to council for consideration and provide feedback at the next committee meeting. Ben outlined the progress of the kiosk for the terminal. The contract has been signed and Nektar completed a site inspection on 26th August to complete measurements required for fit out. Nektar will commence fit out on 23rd September through to 3rd October. The kiosk will be operation by 10th October 2013. Council has approved the third check-in counter. In anticipation of this, Ben had already been in contact with Ansir Systems for quotation of the conveyor system required to fit into the existing system. The quote has been received and additional equipment has been ordered. The old terminal seating was not placed in the terminal for use. Upon inspection of the seating it was found to be unsatisfactory as it was not safe. The new terminal seats have been ordered and the delivery date provided by the supplier is 16th September 2013. Cr. Denton advised the committee that the minutes from the committee meeting will now be provided to council for acceptance. This is a means of tracking timelines for actions arising from meetings. A fault with the Computerised Check Bag System (CBS) occurred on 28th August. The fault was the result of a power regulator failing. CBS unit was not operational because of this failure. Secondary screening measures were implemented during this period. There was minimal impact to passengers during this period. Some flights were a few minutes behind schedule, but the majority still ran on time. The technician from Smith’s Detection arrived on 29th August to repair the fault and the unit was operational again by 1pm on 29th August. The committee discussed the cause of the failure and preventative measures. Ben outlined the steps currently being taken to identify the cause and what will be implemented to prevent this in future. Tony Partridge outlined to the committee the interest of improving passenger transport to and from the airport from town. Particularly the development of shelters for passengers at taxi and bus waiting areas. Translink are able to fully fund the development of these shelters, and only require plans for the car park development so as to locate the shelter in appropriate areas. Anthony will complete a site inspection with Ben to move forward with this development in line with the current car park development plans. Jenny Nobel of Roma Cabs was present to discuss the current difficulties taxis are having being able to pick up and drop off passengers close to the terminal. As the busses are currently parking along the front of the terminal and along the entrance road to the terminal, the taxis are unable to get in close to the terminal for passenger pick up and drop off. Jenny requested the taxis be permitted to park in the cemented area of the baggage collection area. The committee discussed the proposal and were concerned about passenger safety if the taxis were to park in this area. As this area is the baggage collection area, there is a high volume of passenger movement. With the approval of the terminal development, this vicinity will not be available as the terminal will encroach on this area and the remaining section will become an airside area. New developments in the car park will also cater for buses that are parking taxis out of prime passengers pick up/drop off areas. The committee discussed the need to monitor the buses closely to ensure that in the interim, they are not parking along the front of the terminal and in the taxi bays. The committee agreed that written correspondence needed to be sent to companies so that they are aware they are not permitted to park in this area. Anthony Partridge advised that he could provide a letter the Ben that outlines the regulations and penalties of parking in this area, along with the list of fines. If necessary, infringement notices can be issued. That Airport Management provide written correspondence to gas industry companies to advise on the parking expectations of the Roma Airport. Ben updated the committee on the issues being encountered with FIFO passengers waiting in the GA area. Passengers have been obstructing traffic by standing on the roads, leaving rubbish on the ground in the general area and urinating on the back of the Aero Club building. Ben out the item to the committee for discussion of possible avenues to prevent this from occurring. The committee discussed the need for adequate signage to direct passengers for amenities. The current lack of signage could be a contributing factor to the issue. Greg Shaw advised the committee that the Aero Club are discussing the construction of a deck with a sheltered area at the Aero Club for use by passengers waiting in this area. The addition of this area would encourage passengers to wait for flights on the deck rather that on the road, as is currently happening. The only other solution would be to close off GA access and push passengers up to gate 3. Greg Shaw advised that a previous suggestion was to have a pathway run between the Aero Club and the old terminal building and for passengers to use the old terminal building as a waiting lounge. As the building is currently in use the committee discussed alternative to this option. That a path be constructed from the landside area of gate 4 located at the Aero Club and run south along the fence to the current Administration Office shelter. Improve the signage for location of amenities in the Administration Office area. · Injune Airport – Work will commence on 15th September, the airport will be fully operation by 20th September 2013 to aircraft under 5,700kg. · Airport Master plan – The master plan has been approved by council. Currently waiting on the detailed design to be completed, once this has been received it will be brought to the committee. A contribution has been made by Origin and Santos has promised a contribution as well. Discussed expected timeframes for the terminal development. · Additional stands have been placed around the terminal for tourism brochures. Council has commenced construction of a levee embankment that is associated with Stage 1 of the Flood Mitigation Project. 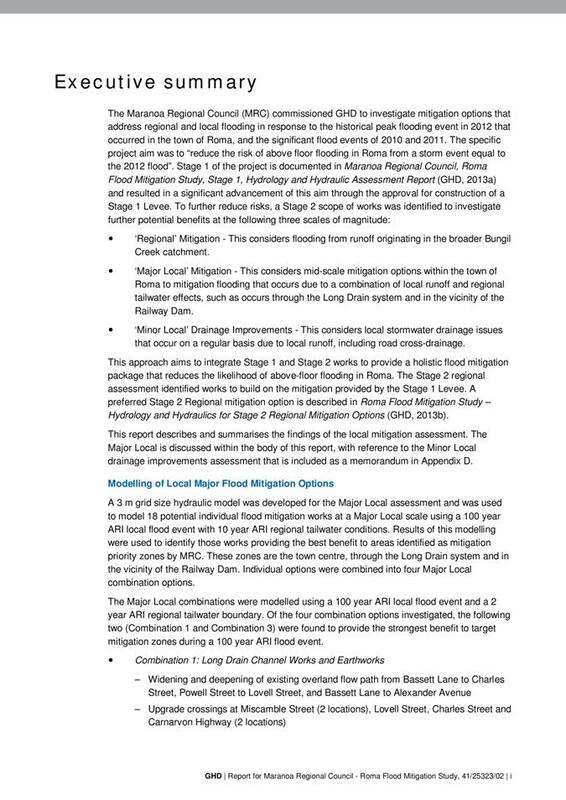 · “Regional mitigation” – this considers flooding from runoff originating in the broader Bungil Creek catchment. 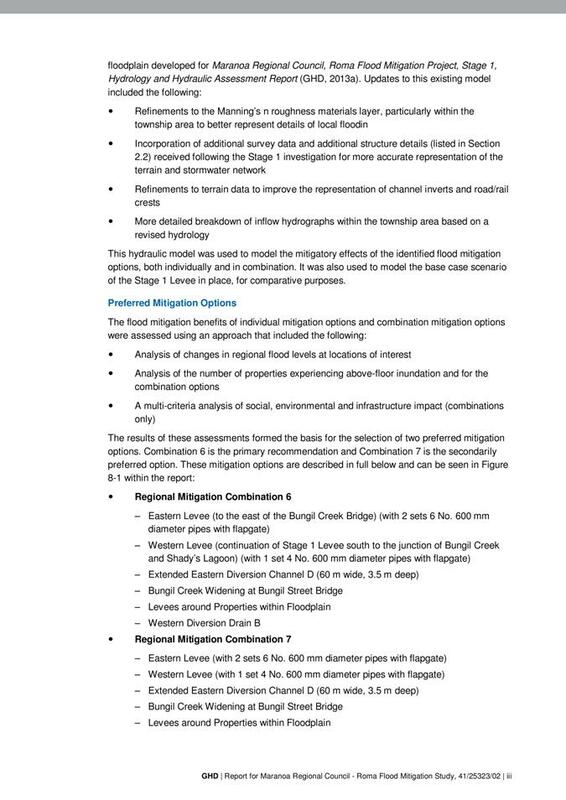 · “Major local mitigation” – this considers mid-scale mitigation options within the town of Roma to mitigate flooding that occurs due to a combination of local runoff and regional tailwater effects, such as occurs through the long drain system and in the vicinity of the Railway Dam. · “Minor local” – Drainage improvements – this considers local stormwater drainage issues that occur on a regular basis due to local runoff. This item tables the Stage 2 report for Council’s consideration. 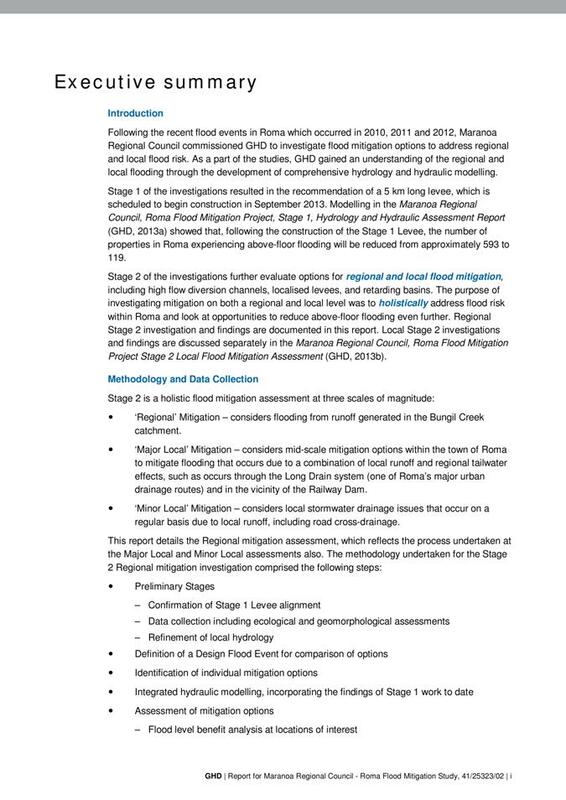 That Council adopt the Roma Flood Mitigation Study, Stage 2 Report. 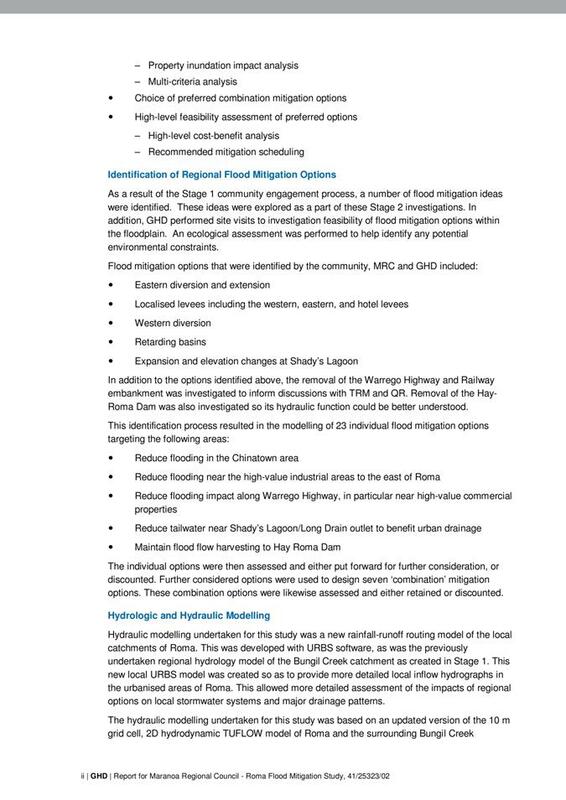 Following successive flood events, Council commissioned studies into how to mitigate against the flooding of Roma from Bungil Creek and local drainage. 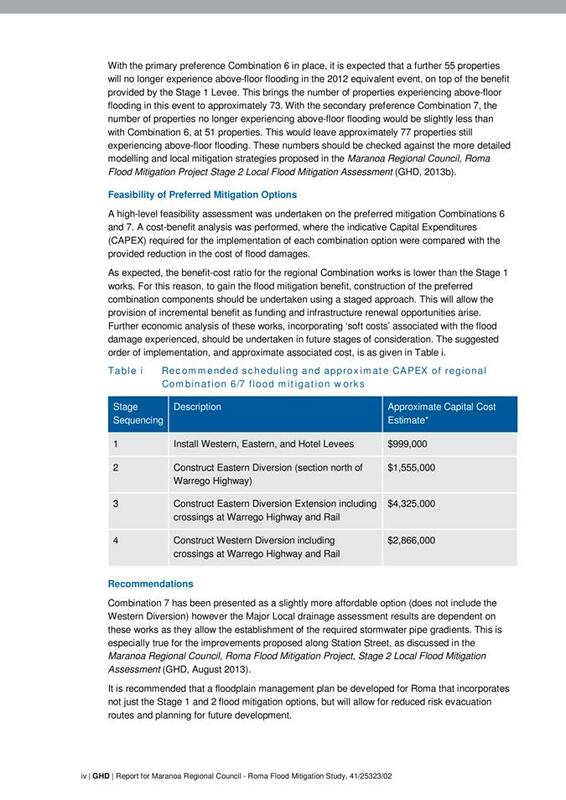 Stage 1 of the Project was adopted by Council early in 2013, and construction work has commenced on Stage 1, which involves a levee. 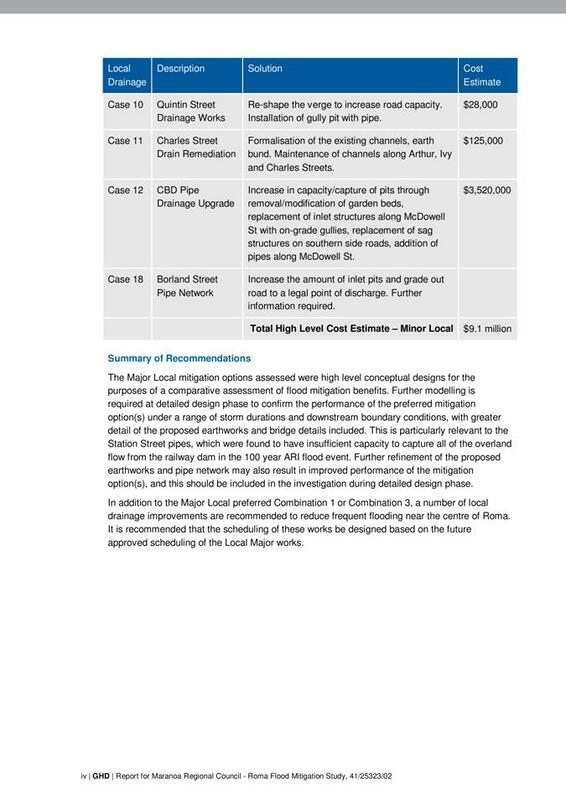 Stage 2 of the Study was commissioned to G.H.D to complete the mitigation options. The completion of the Stage 2 study now allows Council to lobby for various funding options. 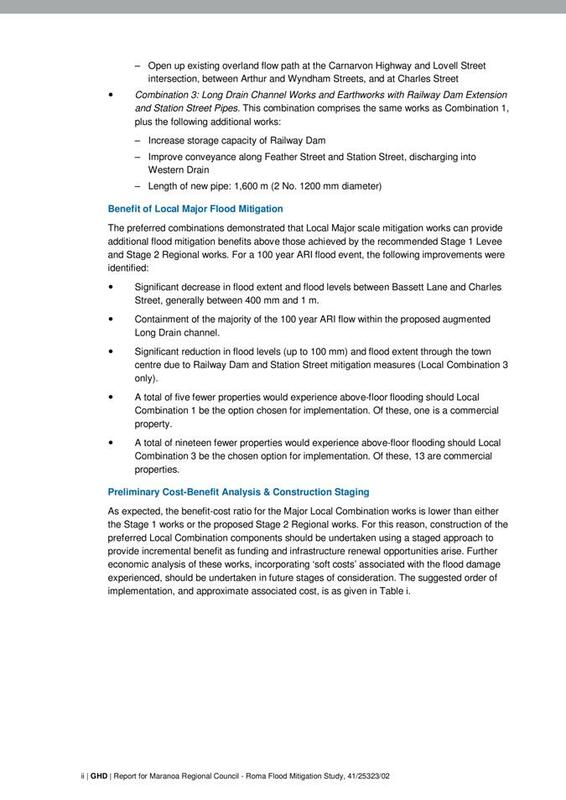 Subject Heading: South St Development - Extension of ROL deadline. Due to extended negotiations between Horizon Housing Solutions (HHS) and Council’s planning department, HHS wishes an extension of time to conclude the ROL process and detailed survey. The extension would not significantly affect the project timeframes to turn key, and normally this matter would be routine, however because this is a variation of a contract which was approved by Council resolution, we seek the formal amendment by Council. 2. time is to remain of the essence. Council is in tripartite agreement with Origin (APLNG) and Horizon Housing Solutions Ltd (HHS) developing Council owned land in South Street Roma. HHS will develop the land and build in stages up to 16 townhouses/units, and when completed provide clear title to a number of units of equal value to the land which is Council’s only contribution to the development. In accordance with Council resolution GM/01.2013/23 of 23 January 2013, a contract of sale which contains certain deadlines/conditions to the development, was signed off on 7th August 2013. 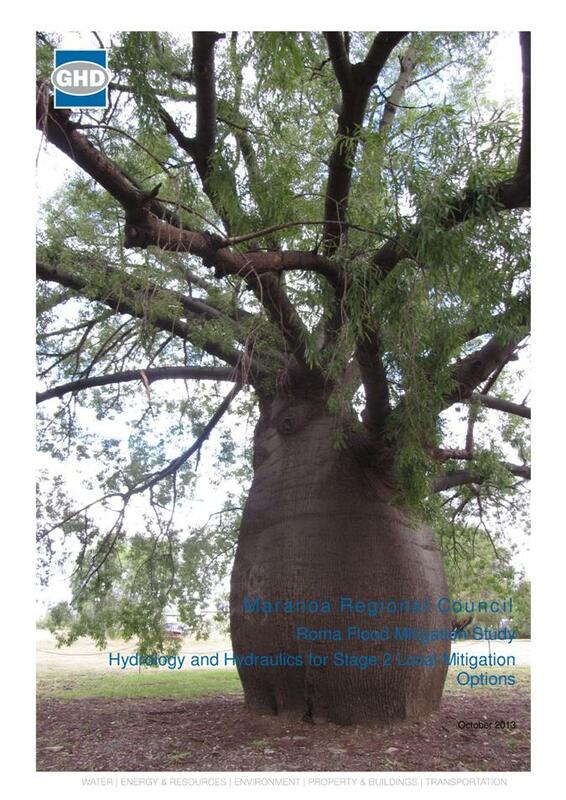 This contains a due date for Realignment of Lots (ROL) and Survey completion by 18 November 2013. HHC have advised our legal counsel that it is expected that the negotiations around the ROL will not conclude by that time and through their Lawyers have requested an extension of the due date to 2 December 2013. Our lawyers have stated in correspondence that they have no concerns in Council granting this request if Council does not have any. F K Gardner and Sons Group have been contracted by Council to complete flood rectification works in Mitchell. The group have approached Council seeking permission to use the fenced area behind the Booringa Heritage Museum as a lay down area for approximately 12 weeks while completing the works. Council provide approval to F K Gardner and Sons Group to use the fenced area behind the Booringa Heritage Museum in Mitchell as a lay down area for a period of 12 weeks while completing flood rectification works in the town. F K Gardner and Sons Group approached Council seeking approval to use the fenced area behind the Booringa Heritage Museum as a lay down area while completing flood rectification works in Mitchell. This area is currently under a tenancy arrangement with the Booringa Heritage Group. 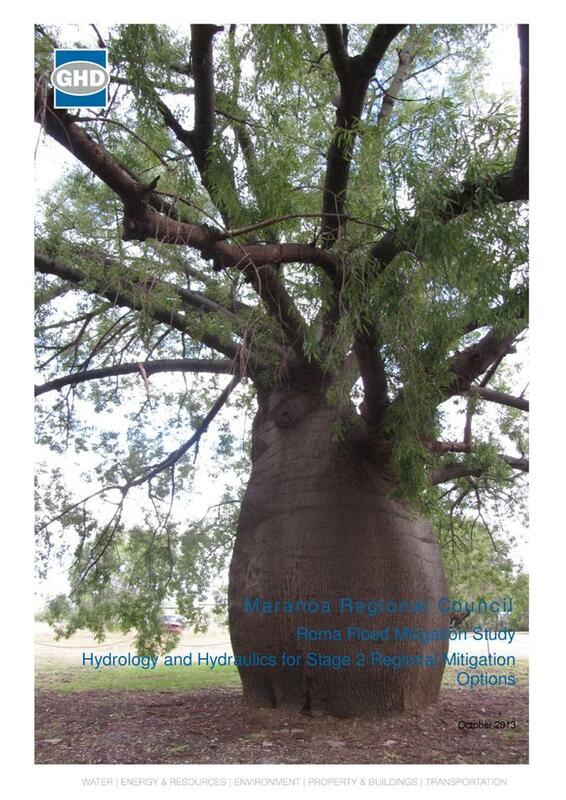 The Booringa Heritage Group have indicated that they are happy for F K Gardner and Sons Group to use this compound. F K Gardner and Sons Group have offered their assistance to the Booringa Heritage Group in return for use of the site including rectification of some drainage issues on the land. However as the land is a reserve under the control of Maranoa Regional Council, it is up to Council to provide approval. Nil. Approval has previously been provided to Albem to use this land during construction of the new Mitchell Bridge. Albem constructed the fence, and as part of their agreement with Council and the Booringa Heritage Group, left the fence on site after the bridge was completed. I had spoke to you last week about the yard at the old Booringa Shire Workshop and I have been to see Stewart over the weekend. We’ve worked out an arrangement and Stewart is quite happy, we will look after some things that need attention in and around the property for him. Our contract requires us to have written notation of any agreement we have for laydown areas, I believe it’s to prevent Contractors setting up in someone’s paddock without proper consideration. I was hoping that I could draft a letter for you to review and sign basically saying that we have your (the Councils) permission to use the yard under the direction of Stewart Hunt who is the designated caretaker. If there is anything particular who would like me to include, please let me know. Otherwise just give me a call and I will draft up a letter for you to approve. 3. Accept the minutes of the meeting of the Maranoa Region Wild Dog Management Advisory Group held on Tuesday 3 September 2013. As Chairperson of the Wild Dog Management Advisory Group I had been contacted by Peter Lucas Agforce Representative on QDog (Qld Dog Offensive Group) and also a member of the Western Qld Dogwatch Committee to see if I would be interested in joining the Western Qld Dogwatch Committee. The Western Qld Dogwatch Committee consists of chairs of the Wild Dog Groups in Western Queensland. The aim of this committee is to set a western area baiting calendar, discuss and make recommendations on identified wild dog issues as a united group, improve management and control practices and to review legislative requirements aligning such improvements. 4. Provide factual information to the Minister on the number of wild dogs in regions, expenditure in undertaking control practices, number of landholders participating in baiting programs. As part of the teleconference the issue of the QDog Chairperson was discussed. This position is an appointment by the Minister of Agriculture, Fisheries and Forestry. Brent Finlay was the previous Chairperson, however stepped down from these duties earlier this year. The committee was convened by State Government as an advisory committee to the Minister for Agriculture, Fisheries and Forestry bringing together State and Local Government , industry and community representatives to provide strategic direction to wild dog management. The QDog committee has not met since earlier this year, and the Western Group is concerned, as there are a number of projects (stated below) that need to move in a positive direction.